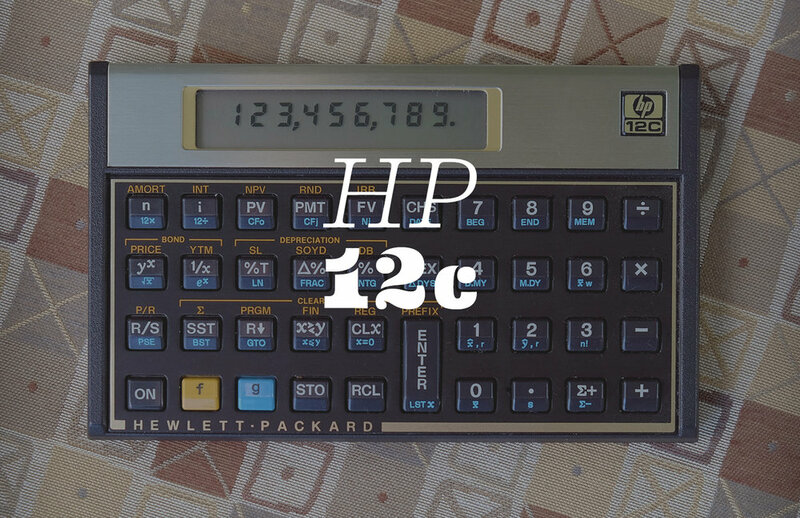 The 12c calculator from Hewlett-Packard is one of those products that is so ubiquitous and familiar that you almost forget it exists, yet at the same time is so different that there's almost nothing like it. Whenever someone pulls it out of a drawer or pocket to do a calculation, no matter how trivial, you know you are dealing with a professional. Remarkably, it has been in continuous production for over 35 years, with very few changes. While there are now fancier and in some ways more sophisticated calculators, such as with screens for doing graphs, the 12c remains a cult status symbol for professionals. The 12c has much the same aura: They are mass-manufactured, yet individual. Learning to use it well involves a pretty steep curve, and, like a sophisticated piece of software, the learning curve keeps going as you get better, egging you on to dive deeper, deeper. For accountants and other financial professionals who need to go beyond basic adding and subtracting, there's a host of sophisticated functionality. Amortization? Yes. Compound interest? Certainly. Calculating Net Present Value and Bond yields? Of course. Today the 12c can be bought for under $50. But when it was launched on September 1, 1981, it retailed for $150 (equivalent to over $400 today). Even at that price it was an instant success. In addition to reducing the number of keystrokes in some situations, other benefits cited by fans of RPN are that it doesn't require thinking about order of operations when doing longer calculations (eg multiplying happens before adding, or putting parts of the calculation in parentheses in order to force a specific order), and reversing of mistakes doesn't require starting over. 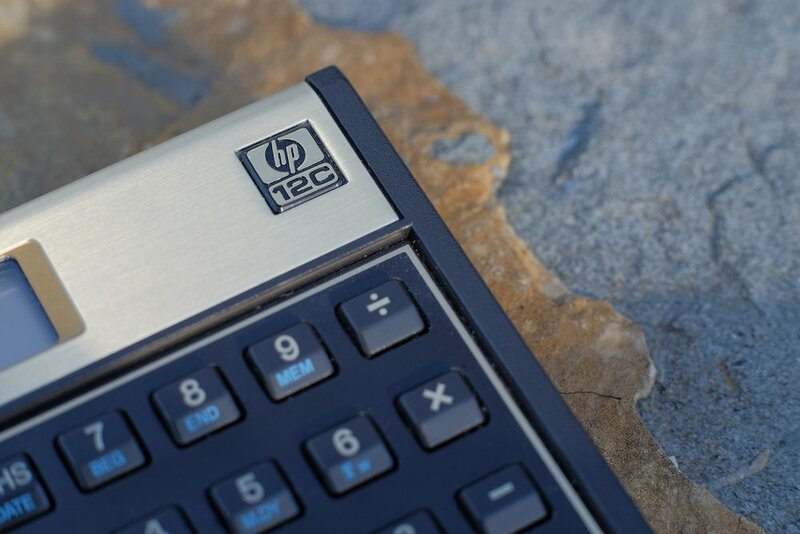 The 12c was the first calculator by HP to employ RPN, and a few others adopted it since. When it came out in 1981 (same year as the IBM PC), the HP12c would have looked rather old-fashioned even for that time. Its utilitarian styling and gold-tone brushed metal panel would have looked more at home in a Radio Shack or Heathkit catalog from the 60's. Compare it next to Sony Walkmans of the time, for example, which were much more high-tech looking (in an eighties kind of way), even though they were really just analog/mechanical cassette players and not state-of-the art computing devices. This also shows the evolution of our gadget culture - today all products are "consumer" looking, but in 1981 a high-end calculator was seen as more of a tool than a desirable consumer product, and so was styled and built accordingly, with an emphasis on rugged functionality. It's surprisingly light weight, but feels sturdy. The keys require a fair amount of force, and have a distinctive trapezoid shape with sloped front faces. To my fingers, they are not particularly ergonomic or quick to use, but I'm far from expert with it, and presumably you get used to it. Rubber feet on the bottom mean that it resists sliding around your desk. The top surface has a very slight tilt to it, which apparently was a late design change driven by the desire to add a third button-cell battery. Instead of increasing the overall thickness, the engineers, just raised the height slightly at the rear (where the batteries are stored), and this serendipitously also helps with typing on the keypad. And the third battery does make a difference. While today we are in the habit of charging our mobile devices every day or so, the 12c can run for months before its tiny button cells need replacing. The back of the calculator provides a cheat-sheet for some calculations. The 12c also came with a large instruction manual that is itself a mini course in arithmetic, and the critical calculations needed for accounting. These days you'd download that as a PDF, but it is very nice having it as a spiral bound book for easy reference and flipping through. (The original spiral-bound one is also sized to be just about the same footprint as the calculator itself.) Having said that, you can download the updated version of the manual in PDF form on the HP site. Apparently build quality of newer models is not as good as older ones. I purchased this one on eBay, and while it's hard to know the exact year, it's at least 15 years old, and in virtually as-new condition. See discussions here and here for perspectives, if you're interested in seeking one out. Earlier I drew the comparison between the 12c and an infantryman's rifle. In fact, some users make this comparison explicit. 12c user Steve Finlay was quoted as saying, "I've had mine for 23 years. Anyone who wants to get it away from me has to practice first with something easier -- like prying Charlton Heston's rifle out of his cold, dead hands." Not exactly the mild-mannered attitude you expect from an accountant wielding a calculator! Another comparison might be a Jeep: rugged, sort of old-fashioned, takes practice to use well in its intended environment, but an unparalleled tool in expert hands. Today, we tend to emphasize ease of use, and how quickly and intuitively one can understand and become proficient with a device or app. And often that's the right metric. But there's also something to be said for forcing a learning period: it creates a bond between the person and the object, as happens when mastering a musical instrument. It means you can employ novel interactions, such as Reverse Polish Notation, that are ultimately more efficient but maybe less intuitive out the gate. Once learned, it's hard to go back to the less efficient, standard way of doing things - the bond between person and object is cemented. Form and features of HP's 12c calculator are unchanged three decades after it debuted in 1981.